We were lucky enough to run into high school chum Cynthia Lovewell at the Pet Place in downtown Menlo Park. 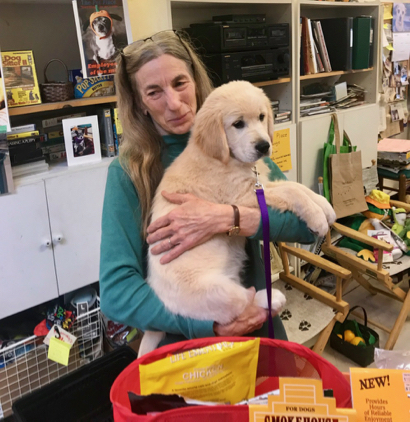 She was there with her new puppy, a 12-week-old Golden Retriever named Sugar “because she’s so sweet!” Pet Place owner Lynn Macy made her feel very welcome, natch. Join Cheeky Monkey Toys (640 Santa Cruz Ave, Menlo Park) on December 31st at 11.30 am for its annual Countdown to Noon. The downtown store will have a noontime celebration for the New Year with fun crafts and activities to bring in the new year — and a balloon drop at the stroke of noon!